The Cape: cancel or keep it? Earlier this month, the peacock network debuted The Cape, a new superhero action TV show. Interestingly, they’ve put it in one of Heroes’ old timeslots. 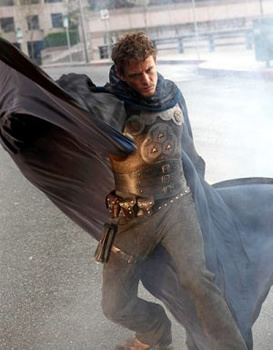 Will The Cape last as long as the Tim Kring series or will it be quickly cancelled instead? The Cape stars David Lyons as Vince Faraday, an honest cop on a corrupt police force. He finds himself framed for a series of murders and presumed dead. Vince is then forced into hiding, leaving his wife Dana (Jennifer Ferrin) and son Trip (Ryan Wynott) behind. Fueled by a desire to reunite with his family and to battle the criminal forces that have overtaken their home city, Vince becomes “The Cape” — a vigilante and his son’s favorite comic book superhero. Others in the cast include James Frain, Keith David, Summer Glau, Dorian Missick, Martin Klebba, and Vinnie Jones. The TV series debuted on Sunday, January 9th, with a special two-hour event. It attracted a decent 2.6 in the 18-49 demographic and 8.45 million total viewers. NBC reran the pair of episodes the following night. The next Monday, The Cape dropped a staggering 30% in the demo to a 1.8 rating and 6.22 million. Last night, the ratings fell another 11% to a 1.6 demo rating and 5.84 million viewers. What do you think of The Cape? Currently, The Cape ranks as the 10th most watched scripted series on the network, tied with Community. It ranks as high as it does because of the premiere’s ratings and because NBC’s schedule as a whole isn’t doing all that well. For a series that’s been on the air for just three weeks, The Cape is already not in good shape. If the ratings continue to decline, it’s almost certain to be cancelled. The network ordered 13 episodes but, for now, only eight of them are scheduled. Another struggling series, The Event, is scheduled to take back the timeslot on February 28th. If The Cape’s ratings continue to sink, one has to wonder if NBC will even bother to schedule the remaining five installments. But, what do you think? Do you like The Cape? Do you think NBC should keep running it or just cancel it now? PLEASE KEEP THE CAPE!!!!!! I WANT TO WATCH THE ENDING AND SEE WHAT HAPPENING GOING ON WITH THE CAPE ENDING!!!!! We need to send “Scales” and his boys to the Producers and talk a little sense into them. its a great show. Summer Glau was underused in The Cape. I hope she finds a show that will last longer and better written. Also, I enjoy watching The Event. Please stop starting a show and then just cancel leaving the viewers wondering about the story. USA Today is doing a survey on which shows should be saved or cancelled. One of their questions was about which cancelled show you want back most. Tha Cape is an option. Go show your support and say what you feel!